Based on the Eighties film starring Michael Caine and Steve Martin, Dirty Rotten Scoundrels is a tautly adapted comedy from Jeffrey Lane, punctuated by bold and brassy musical numbers from David Yazbeck. Sympathetic to the original story yet suitably augmented for stage, the comedy makes the leap to musical effortlessly thanks to a bank of upbeat and bold showstoppers such as Great Big Stuff; a number about material greed and Her I Am; a traditional Broadway number showcasing the leading starlet’s vocals. Catchy and cheeky, the music is consistently uptempo and drives the show at a relentless pace. 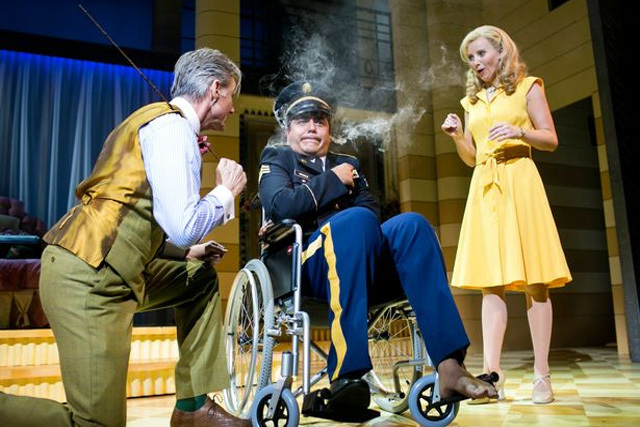 Michael Praed, Carley Stenson and Noel Sullivan in Dirty Rotten Scoundrels The Musical. Whilst some movie adaptations, particularly musicals, can fall short of the material that inspired them, Dirty Rotten Scoundrels manages to succeed on almost every level. The story is strong and absorbing, with comedy which is superbly distilled and performed. Musical numbers are both punchy and memorable, whilst the dance is energetic and impressively purposeful. A classic game of cat and mouse which is endlessly entertaining and meticulously realised for the stage, Dirty Rotten Scoundrels is full of pros without a single con. It’s the perfect summer night’s treat.